Yosemite Falls is the world's 5th tallest. World's tallest: Angel Falls, Venezuela, 3,212 ft., 979 m.
The term falls is best used for waterfalls with multiple drops: Yosemite Falls, Sentinel Falls, Snow Creek Falls, etc. However, the term fall is more properly used when there is only a single drop: Upper Yosemite Fall, Lower Yosemite Fall, Vernal Fall, Bridalveil Fall, etc. 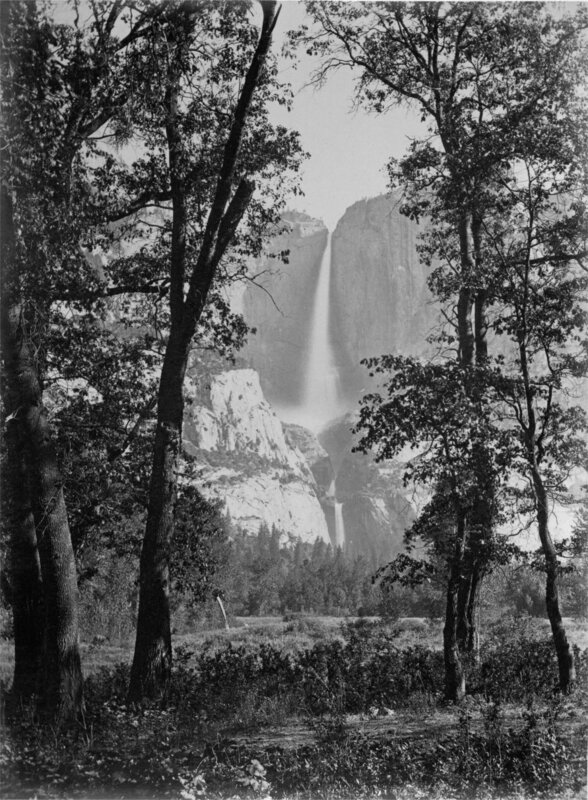 The Yosemite Falls by Carleton E. Watkins, circa 1865-1866 from The Yosemite Book (1869). which converts to 2,400 gallons/second or 9,000 liters/second. Principally snow melt feeds Yosemite Creek and Falls. A good proportion of this watershed is bare granite with limited soil and few lakes for water storage which would prolong a greater water flow into late summer and autumn. So it roars in spring and whimpers later in the season. Bridalveil's watershed has more extensive meadow and forest soil development both in extent and depth resulting in greater water storage capacity. This is due to the greater seasonal availability of moisture and a granitic substrate which more quickly disintegrates. Computed as area above brink of Upper Fall. Source: Jan VanWagtendonk, Research Scientist, using GIS (Geographical Information System), March, 1991. The rivers had more water and the glaciers had more ice, because of the greater size of the upstream watershed, thus giving them more erosive power. These rivers and glaciers had more speed since they flowed down the western Sierran slope, which also provided them more erosive power to cut downward. Tributary streams flowing in from the north or south are relatively less steep since they flowacross the western slope. Nearly all the sheer cliffs form where vertical joint systems allow rocks toflakeoff thus exposing relatively-clean, nearly-vertical surfaces. Rocks continue to flake off and the cliffs have receded significant distances since glacial times. The extra water (and winter ice) provided by tributary streams have greatly accelerated cliff recession where waterfalls pour over. All major falls in the valley have created their own recessed alcoves in a way that glaciers could never have carved such alcoves. Both Yosemite's Upper and Lower Falls sit in such recessed alcoves. Why does Yosemite Falls have 3 levels or drops? This is again due to joint systems (groups of linear cracks). This time the joints are running horizontally. Two horizontal joint systems interrupt the vertical joint systems. One horizontal joint system is near the base of the upper fall and the other near the brink of the lower fall. Therefore, vertical weaknesses (forming cliffs) meet horizontal weaknesses (forming benches). These two horizontal joint systems are clearly visible running both left and right away from the falls area a quarter mile or more. They are highlighted by the increased amount of vegetation that is encouraged by more ledges, cracks and soil at those locations. Principal Waterfalls of the World by C. Frank Brockman (1945). Compares Yosemite waterfalls with other waterfalls of the world in form, height, and size. Copyright © 1997-2006 Dan Anderson. All rights reserved.